1 John 1:9 9 If we confess our sins, He is faithful and just to forgive us our sins and to cleanse us from all unrighteousness. Can you see it? There on the edge, a small hint of mold. It is damaged goods! 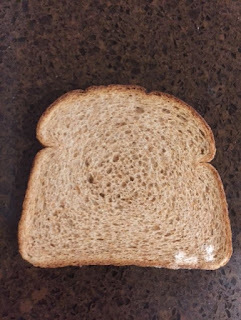 The revelation that this slice of bread was not fit for eating came to me after I had been using slices from this loaf for two days. Rushing to make toast each morning, I had been reaching into the bread box grabbing a slice and throwing it into the toaster without looking. I had not examined the bread. I just assumed it was good. This particular day, I was in no particular hurry and finally noticed the bread was defective. This scenario occurred a few months ago. I took the prerequisite photo shot and yet I have not been able to write a post about my experience. I could not write until now.